Well here we are in Greece on our 26th wedding anniversary. We arrived in early morning mist but the sun soon burned off the mist allowing us to explore the ancient acropolis bathed in sunlight, but not too hot. 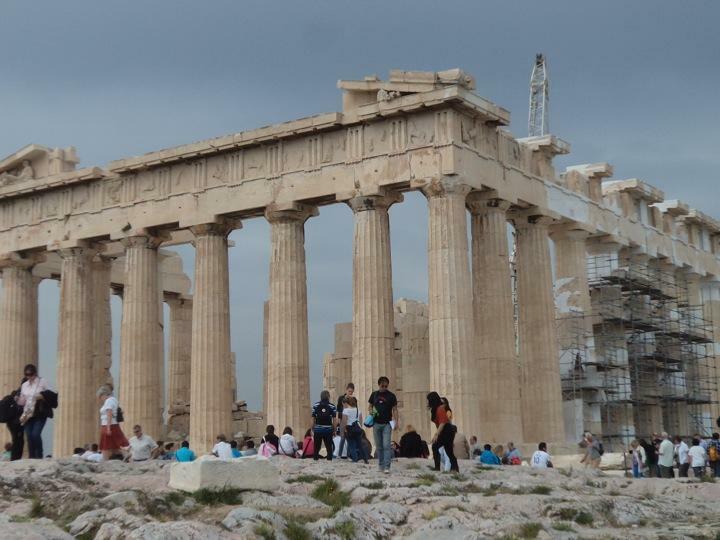 We saw the temple of Athena Nike, the alter of Athena and the Parthenon itself, celebrating the victory of Athena over Poseidon and of course her own birth in the presence of the other gods. Evident all around is the fine creative architecture that clearly inspired the Romans, in turn, to create the wonders that we are familiar with. This will be some sight when the repair work is complete but that may be another 50 Years. At present there are less colums and plinths in place than 10 years ago as they have been removed for renovation. This does little to detract from the spirit and sense of awe felt at this location for the past 2500 years. Another wonderful morning exploring, and one not to be forgotten. Late lunch was taken at a taverna where too much red wine was consumed along with the obligatory moussaka and Greek salad. The lengthy lunch sheltered us from early afternoon showers. We eventually trundled back on board for around 5 pm where we sat aft (at the back for your land lubbers) and soaked up early evening sunshine with piña colada and Stella! As the sun set we went to the restaurant for dinner to find that Barbara and Frank had arranged a cake for us and a chilled bottle of champagne! All the waiters gathered around the table festooned in balloons and sang congratulations to us. It was a very kind gesture which left Wendy and I very flattered and more than a little embarrassed! A brilliant anniversary on our would tour.